Researchers from the Department of Energy’s Pacific Northwest National Laboratory (PNNL), UOP and Netherlands-based Utrecht University have found a way to understand chemical transformations occurring within zeolites. Zeolites are crystalline solid structures made up of aluminium, silicon, and oxygen atoms, and are used to convert oil to gasoline. They are also used as catalysts to process petroleum and chemicals. The new technique allows the identification of the spots where chemical reactions occur ,and how these spots shut down. These spots are said to facilitate molecules rip apart and rearrange as they are passed through nanometre-sized channels. Data from the study will allow scientists to find ways to keep the factory running, as well as enhance catalysts that help produce fuel, biofuel and other chemicals. As part of the study, the team redesigned the 3D atomic map of a zeolite material to track its key element, aluminium. They used a characterisation technique called atom probe tomography to study zeolite structures. It uses a pulsing laser to move a sample. Images of the sample confirmed that steaming causes aluminium atoms to cluster, which effectively shuts down the catalytic factory. Over time, zeolite crystals grow in overlapping sub-units and form a 3D Venn diagram-like structure. Aluminium is clustered at the edge between two sub-units called grain boundary. PNNL said: «With the guidance of these atomic maps, industry could one day modify how it steams zeolites to produce a more efficient, longer-lasting catalyst. Netherlands Research School Combination-Catalysis, the Netherlands Research Council and PNNL’s Laboratory Directed Research Development programme have supported the project. 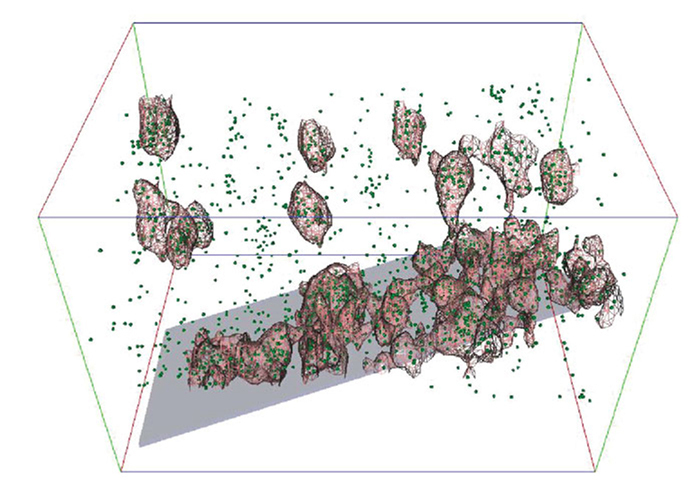 Image: Green dots in the image represent aluminium atoms within a zeolite crystal. Photo: courtesy of Pacific Northwest National Laboratory. Προηγούμενη δημοσίευσηΣυνέντευξη του Ν. Λυγερού "Center TV"